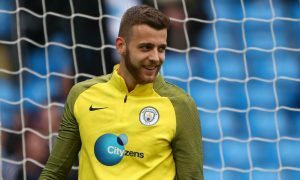 Angus Gunn is at the centre of a tug-of-war between England and Scotland with the Manchester City goalkeeper facing the decision of competing with the likes of Jack Butland and Jordan Pickford for a spot in the Three Lions senior team or a more straightforward route into the Scotland goal. Gunn, who is reportedly wanted by Stoke City and Celtic next season, is eligible for either country, and his father Bryan Gunn is a former Scotland international who won 6 caps for the Tartan Army between 1990 and 1994. 22-year-old Angus is one of England’s most highly-rated young goalkeepers, having impressed on loan at Norwich City this season, and Scotland number two Peter Grant has admitted that the door is open to the England under-21 international representing Scotland. “You’ll never shut that door till it is impossible because Angus is a top-quality goalkeeper,” said Grant. “If he decided to come to Scotland, you would obviously welcome him with open arms. There’s no doubt about that. “England seem to have a lot of top-quality goalkeepers, they keep saying, so it will be interesting. “With the name Angus, you’re wondering, ‘Can he get away with playing for England anyway?’. “I’ve known him a long time. When I was at Norwich, Angus was a baby there, playing in the youth teams before he went to Manchester City.